How far you sit from the viewing screen makes a huge difference to how deep the stereoscopic image will be. Sit close and the round table will be a transverse oval. When the table is round, you are sitting at exactly the correct distance for this image. You must sit directly in front of the image. If you sway to the side, the table will distort to an oval at an angle to the picture plane. Keep swaying and the table will dance for you. Hmm, that does not happen in real life, so that is another strange effect of 3D images on a flat surface. Correct viewing distance is built in to the image by the stereo base and distance to the object. sets the correct viewing distance for a distortion-free stereo experience. Changing the size of the image on the screen makes no difference, the undistorted viewing distance is not altered by magnification. The undistorted viewing distance for an image is a constant for a particular viewer, which can only be changed by distorting the image itself. The image has been stretched sideways. Now you sit further back to see a round table. The image has been squeezed sideways. you sit closer to see a round table. That is the end of my experiments with Charles Darwin's table, as recreated in Down House, England. How far back do you sit to make the garden and house have realistic depth? Human perception of roundness applies to objects of any size in the Universe. Stereo Microscopes and Telescopes follow the same roundness rules as rooms in houses. Here is the sun, photographed in 3D by the two STEREO mission space craft, through telescopes with ultraviolet sensors. The STEREO craft supply the largest stereoscopic baseline humans have yet seen. 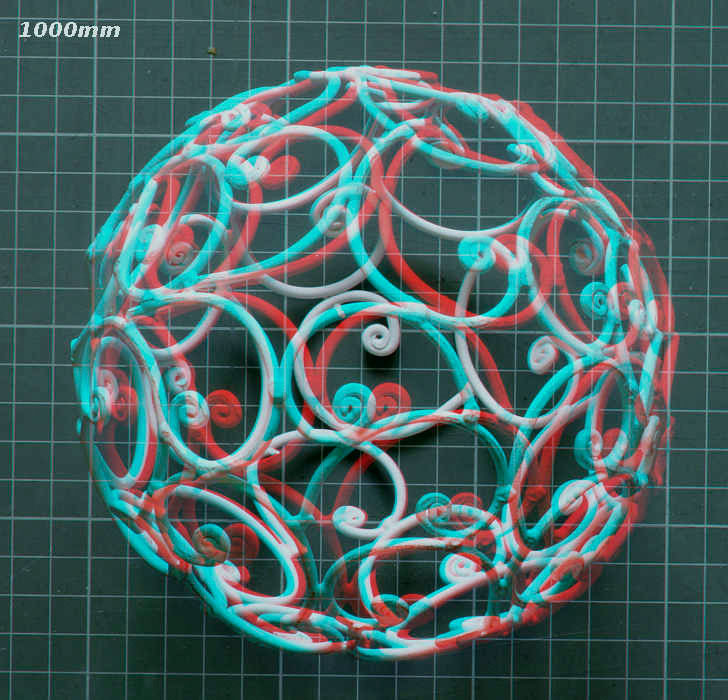 But the same roundness concepts apply to their 3D images. 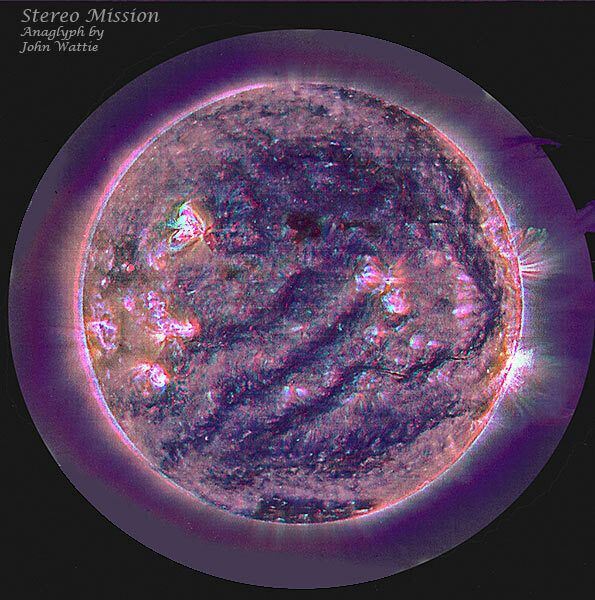 Early in the mission, when the craft were not yet separated by a huge distance, the stereo base was bigger than anything on earth, but a lot less than later on. The sun looks flattened on a computer screen, because the stereo base was not yet big enough for correct roundness. But maybe, "base is not big enough," is a wrong statement? Like magic, the sun will seem to "put on weight" and become rounder. My computer room will only let me reach 2.5 meters from the screen (by backing out the door) but by then the sun is nearly perfectly round. Two and half to three meters is about where you would be watching 3D TV from (if you had one). 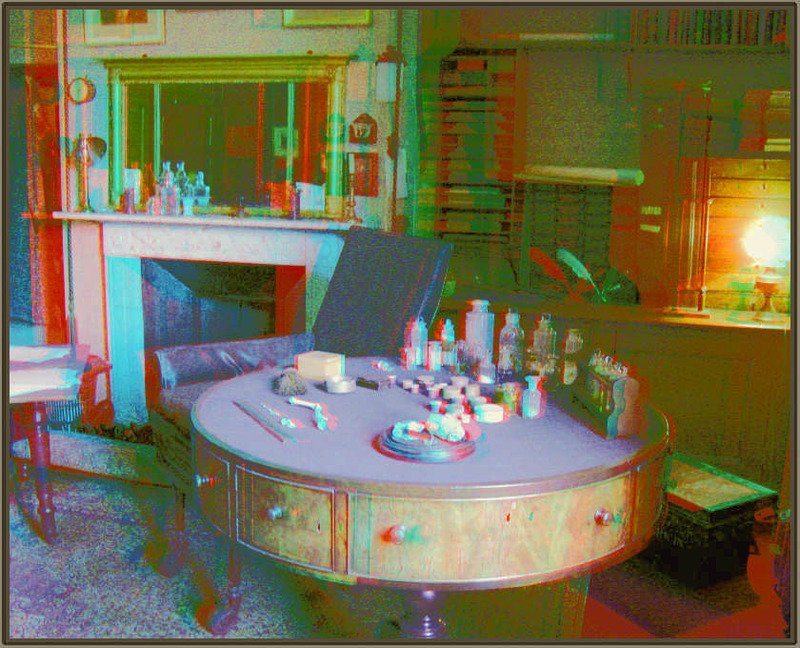 I have made STEREO mission anaglyphs after the two space-craft separated further; with correct roundness, or stereoscopic perceived depth for a computer, and they are available on this web site. Hmm. 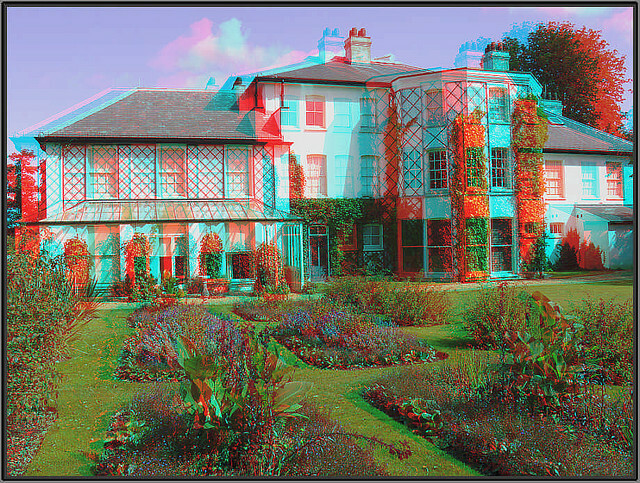 It seems computer screens, TV screens and projector screens are very different when it comes to watching stereoscopic 3D, so we had better look further into this roundness business. I want to think about stereo roundness now, so we have to move from a table to a sphere. Stereoscopic Roundness or Stereoscopic Perceived Depth. If you do not want to think about roundness yet, use the top menu bar and ponder other 3D stuff. mathematics of "stretch and squeeze part 2". Stereo Roundness with telephoto lenses. Roundness with macro-photography: second edition not yet on the web, but all worked out and coming when I get the time, no worries!